Whether you admire them up close or from afar, leaving 100% natural love notes in unexpected places will let your s.o. know how much you care about them – and the planet. Why pay for a skywriter and waste precious fossil fuels, when everything you need to surprise your boo is in your laundry room? 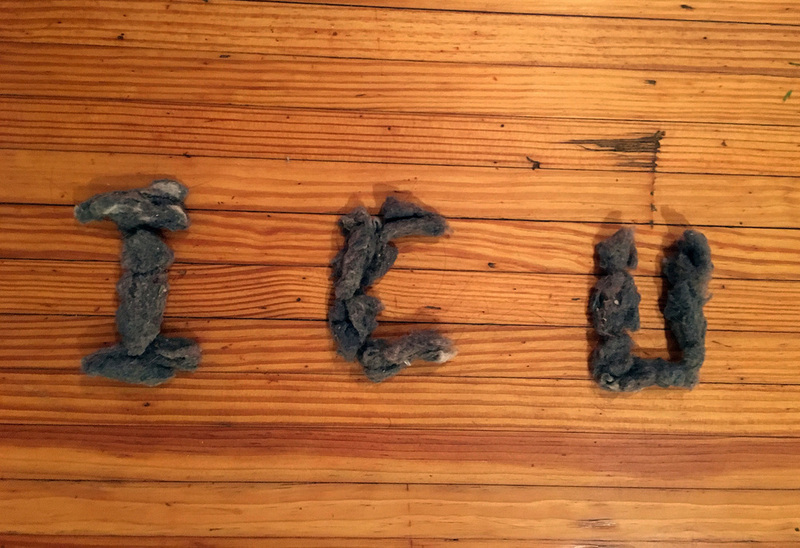 Save lint from your dryer and use it to spell out meaningful messages for your significant other. Don't have a bae? Spend your lonely nights knitting that lint into a sweater. Goodness knows you'll need something to keep you warm on those cold winter nights. When it comes to bathroom savings, you've heard the expression "if it's yellow, stay mellow; if it's brown, send it down"? What a wasteful maxim! Try this one instead: “one flush a week yields the savings you seek!" It actually takes more energy to turn your television off and on twice, than it does to keep it on all day long. So go ahead – Netflix and chill your life away. Is your refrigerator running? If it is, you better go catch it – and then unplug it. These massive appliances are huge energy wasters. Unplug it today, and save tomorrow. Think those small animals powering electronics on The Flintstones are the stuff of Hanna-Barbera science fiction? Think again! With the help of God’s creatures, lighting up your home is as simple at 1, 2, 3! Head to your nearest pet store, purchase thousands of hamsters, cages, cedar chips, water bottles, food and hamster wheels. Stop by the hardware store on your way home, and stock up on tiny helmets and electrodes. Watch episodes of Beakman's World for helpful "how-to" tutorials. Set up your home system, and let science do the rest! Don't throw out expired foods! Donate them to your local shelter, and write off the expense. Everybody wins! Stop spitting money – and precious resources – down the drain. The next time you brush your teeth, save your spittle in a bottle. You'll save a "mint" when you use it as a minty-fresh mouthwash later. Turn your love of online shopping into a discounted trip overseas – no passport required! Simply save your Amazon boxes over the course of a year, and then tape them altogether to form one giant box. Poke a few air holes, step inside, and ask a friend to add a stamp and drop you off at your nearest post office. You'll be in Costa Rica in 2-14 weeks for just the cost of a single Forever stamp! If your pantry is overloaded with an excess of grocery bags, and you're stressing about how to afford that carrier for your new baby, fret no more. Any bag with handles makes a great carrying case for kids six and under! Paper or plastic? You be the judge! Stop throwing your cat litter out with the rest of the garbage. If you live in a climate that has a cold season, save your used litter throughout the year – and use it on icy surfaces in the winter. Not only will it add some much needed traction, but the clumps will help cushion you in the event of a fall. Whether you have a child in diapers or know someone who does, don't let those old newspapers go to waste. Bird owners use them to line their cages for a reason. This super absorbent material might be a little rough on baby's bottom, but it'll be gentle on your budget.